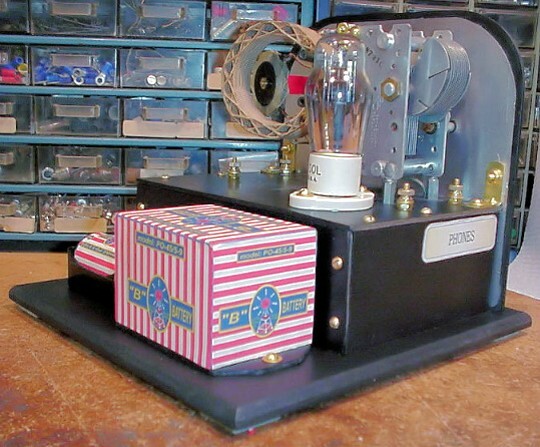 Mike Peebles', VT-67/BC, One Tube Regenerative Radio, Front View. Haven't built a set for a while, and decided I should. Had this special coil that I bought off eBay, and decided it needed to be in a nice looking set. Decided to build a simple one-tuber, with a VT-67 tube. I have a whole box full of these tubes, and they are really a #30-Special. This tube has a filament of 2V. at 120mA. The #30 has a filament of 2V. at 60mA. I use 1-1/2V, and it's just right, with a B+ of 45V. This set actually works better than I thought it would. Had to add a "Fine-Tune" variable, as the coil was only 180-uHy, and wanted to cover the entire BC band. So, with a paralleled 140-pf, with the main tuning variable, it covers the BC band just fine, with lots of tuning versatility. With initial tests, after "fine-tuning" components, could do some nice DXing out of BC, and several surrounding states. Set is approximately: 8-1/2"-w x 7-1/2"-hi x 9-1/2"-Deep, w/batteries. 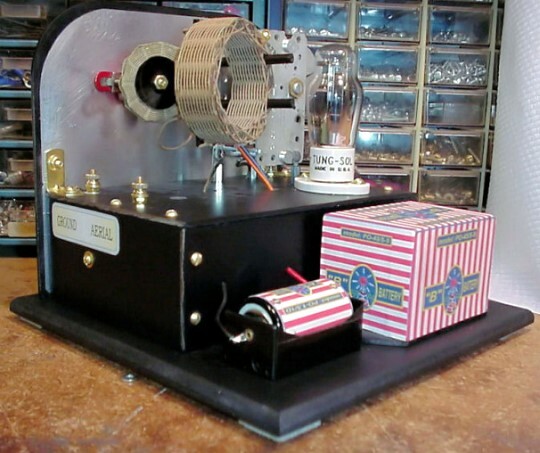 Powered by: 45V, B+ (5-9V batteries in series), and 1-1/2V "D", for A+, in custom housings of period artwork. 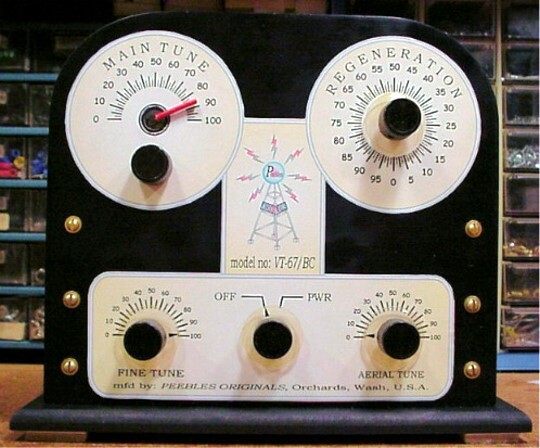 Tunes standard BC band, 540kHz to 1700kHz. Very selective and sensitive. Regeneration is accomplished via variable coupling from tickler coil to the main tuning coil, and is very smooth. This radio is sold, but more will be available. Mike Peebles', VT-67/BC, One Tube Regenerative Radio, Rear View. 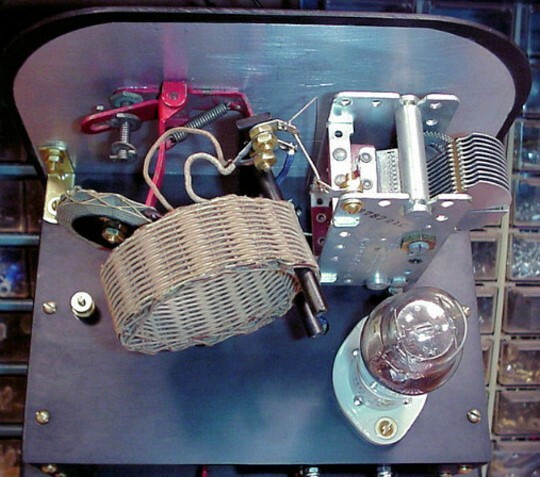 Mike Peebles', VT-67/BC, One Tube Regenerative Radio, Left Corner, Rear View. 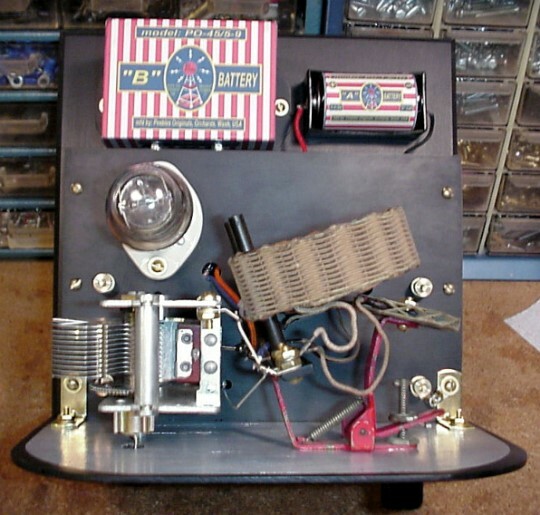 Mike Peebles', VT-67/BC, One Tube Regenerative Radio, Right Corner, Rear View. Mike Peebles', VT-67/BC, One Tube Regenerative Radio, Rear, Component View. Mike Peebles', VT-67/BC, One Tube Regenerative Radio, Front, Component View. 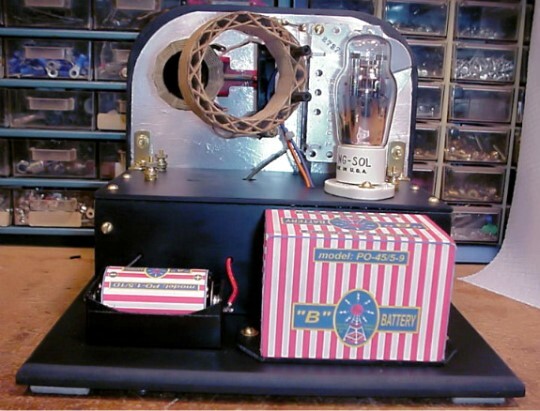 Mike Peebles', VT-67/BC, One Tube Regenerative Radio, A/B Battery View.